Board Highlights: Potential 2019 bond, 2020 Spring Break adjustment, enrollment report, college admissions report and more! In November, the Board heard reports on several topics including the official and final enrollment update, new course proposals for 2019-20, the third category review (facilities) for a potential bond and the annual college admissions report. Please note: we have numerous opportunities for discussion and involvement, which are listed online. See a synopsis of the November meetings below. The full Board agenda packets are online. The Board heard discussions on the third table of items (Facilities) in connection with a potential 2019 Bond. The categories in discussion are: Safety & Security, Energy Efficiency & Conservation, Facilities, and Student Programs & Support. Each category will begin discussion at the Bond Advisory Committee then follows with a presentation to the Board. See Facilities memo and presentation. Future discussions and information and audio are available on www.eanesbond.com. The fourth table of items (student programs & support) is up for discussion at the December 4 Bond Advisory Committee meeting and the December 11 Board meeting. Both meetings are open to the public. The Board was presented the adjusted 2019-20 student calendar following the University of Texas 2020 Spring Break announcement. Until now, the calendar reflected two Spring Break possibilities with Board direction to follow UT's lead. The District Leadership Team approved the adjustment earlier this month. Westlake High School staff presented the College Admissions Annual Report at the November 6 meeting. The report outlines the Class of 2018 successes and outcomes, including which colleges students attend. The report also provided information on the Advanced Placement program. See Admissions presentation, summary data and AP report. The Board approved legislative priorities in preparation for the 86th Session of the Texas Legislature, which formally convenes on Jan. 8, 2019. A committee of Board representatives and community members researched and collaborated on the document. The Board was presented the official enrollment for 2018-19 based on the PEIMS Snapshot date of October 26, 2018. Compared to 2017-18, overall enrollment has increased 63 students for a total of 8,124. Westlake High School has an enrollment of 2,789, which includes 19 students in the Adult Transition Services program. Curriculum and Westlake HS staff presented new course offerings for the 2019-20 school year. New course development is guided by the district's mission and is in response to student interest and innovative trends. The Board is expected to vote on the new courses at the December 11 meeting. See new course proposals memo and presentation. The Board recognized 28 National Merit Semifinalists from Westlake High School. Semifinalists represent less than one percent of U.S. high school seniors. 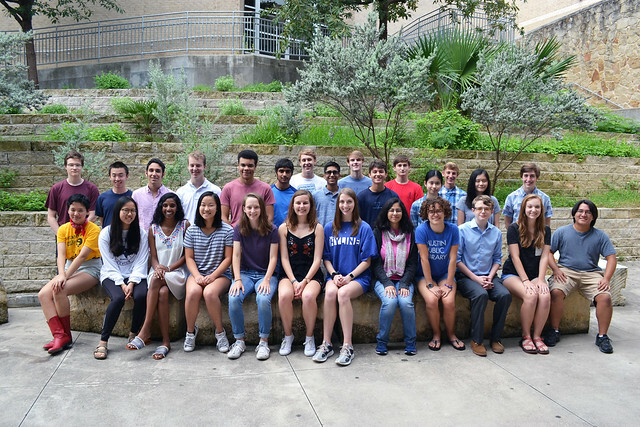 Overall, the National Merit Scholarship Program recognized 110 Westlake High School students, with 28 Semifinalists, 59 Commended and 28 Hispanic Scholars. Five students received the Commended and Hispanic designations. Due to the holidays there is one meeting in December. The regular meeting is December 11 (7pm open session). Always check www.eanesisd.net/board/cal for the most up-to-date schedule. To see agenda items, listen to meeting audio, or access board policy, please visit www.eanesisd.net/board. Board Highlights: 2019 Bond election info, Spanish Immersion pilot update, enrollment, staffing and budget for 2019-20 and more. Board Highlights: Final potential bond category review, District's bond capacity report, Digital Learning Task Force update & more! Board Highlights: Special Education initiative, potential 2019 Bond, Digital Learning Task Force and more!